[Sam M] wrote in with a quick proof-of-concept demo that blows our socks off: transferring enough power wirelessly to make a small quadcopter take flight. Wireless power transfer over any real distance still seems like magic to us. Check out the videos embedded below and you’ll see what we mean. What’s noteworthy about this demo is that neither the transmitter nor the receiver are particularly difficult to make. The transmitting loop is etched into a PCB, and the receiver is made of copper foil tape. Going to a higher frequency facilitates this; [Sam M] is using 13.56 MHz instead of the kilohertz that most power-transfer projects use. This means that all the parts can be smaller and lighter, which is obviously important on a miniature quadrotor. High-power and high-frequency can still benefit from having a wire to run along, but transmitting a few watts across thin air like this is a sweet demo. Thanks for sharing, [Sam]! Looks, and sounds, like a bug caught in a bottle. When he’s fumbling around with it at the beginning, he’s getting it spinning, that’s why it looks smooth. I don’t know why he’s doing that though. This would be excellent as a wireless charging station for drones. Have them located on rooftops all over with exact coordinates and orientation markings publicly available. Then a drone can hope on one of these for 5-10 mins when it is low on power and carry on its way. My question is the usable range of the power source. 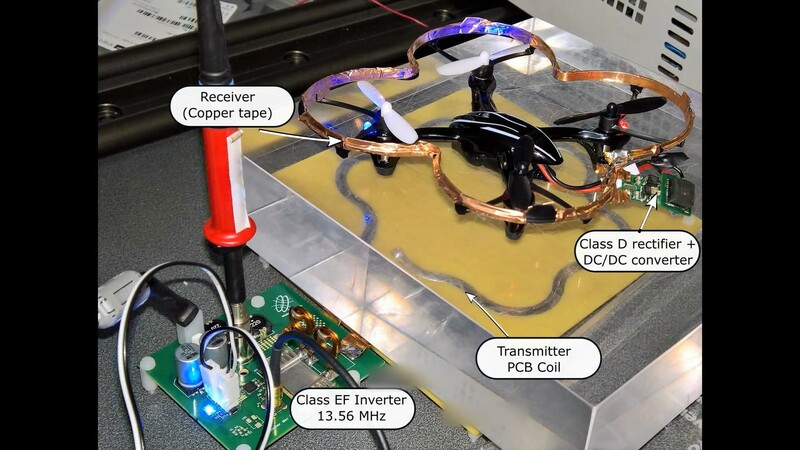 Wireless power transfer at a good range (hundreds to thousands of feet) would be useful. Even in the tens of feet it can find uses. Less than a foot…meh. I think this is work in progress, only short distance (10 cm?). Still much better than chi charging. Wireless power transfer gets four times less efficient as you double the distance. The big advantage is that take off energy can be provided, and it can transfer power even if the drone isn’t perfectly aligned, while flying! Yeah, even more HF-junk in the air. Seriously, who need this? Charging your iSomething placed on a special surface maybe, but over the air? Wireless is more efficient and no need to stop. They killed N Tesla, The search have to start again ! Hmm, Needs more power.. *Sticks fork in the microwave to jam the safety switch on then point that at the quad. These devices will pollute the RF spectrum like nothing else… pretty sure this would not comply with FCC regs. It’s so nice to see Tesla’s work on wireless power transmission for vehicles put to use. Took people long enough. 13.56 MHz is a wavelength of 23 meters, not 23Cm.